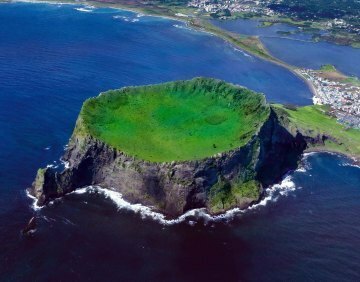 JEJU ISLAND -- The southern South Korean resort island of Jeju has been named as one of the new seven natural wonders of the world in a worldwide poll, a Switzerland-based organization announced Saturday. The subtropical volcanic island, located 130 kilometers off the southern coast of the Korean Peninsula, was selected along with Brazil's Amazon region, Halong Bay in Vietnam, Argentina's Iguazu Falls, Indonesia's Komodo National Park, the Puerto Princesa Underground River in the Philippines and South Africa's Table Mountain, according to the New7Wonders foundation in Zurich. Jeju Island had been vying against 27 other natural sites in a project initiated by the Switzerland-based nonprofit organization in 2007. Voting to select the New7Wonders began in July 2009 on the Internet and by phone, with the last vote being received on Friday. South Korean President Lee Myung-bak congratulated Jeju on being picked as the new natural wonder prior to departing for the 19th Asia Pacific Economic Cooperation summit meeting. He said that the selection is noteworthy because it was carried out by popular vote from people living all over the world. "More effort must be made to develop and preserve the island's beauty so it can become a natural heritage for all mankind," he said. The president voted for Jeju in September and had been one of the staunch supporters of the bid. This view was echoed by the National Committee for Jeju New7Wonders of Nature, an organization to help the island. Former Prime Minister Chung Un-chan, who led the organization, said the selection represents global recognition that the island has the potential to become one of the most attractive tourist destinations in the world. Such a development could have long-term economic benefits for Jeju. Known for a combination of scenic mountains, waterfalls, forests, caves and beaches, Jeju has been popular with South Korean honeymooners and tourists from neighboring countries such as China and Japan. "A good harmony of human and nature is the characteristic of Jeju Island," Chung said. He said the selection of Jeju as a natural wonder will boost the country's image as a tourist and cultural spot in addition to its fame for speedy industrialization and democratization. "Most of all, the tourism revenue of Jeju Island will sharply increase and other regions of South Korea will have related effects," Chung said. "The enhancement of its national status will have a more valuable effect." Reflecting this, the Jeju Development Institute, a local think tank, said the annual number of foreign tourists may rise a maximum 73.6 percent, translating into an additional 1.2 trillion won ($1.06 billion) for the local economy. Jeju Governor Woo Geun-min also said that it will open a new chapter in the island's tourism industry. "Now, we have gained confidence that Jeju can be attractive to the world," he said. He vowed that the island will use the opportunity to bolster its tourism industry to the next level. The Jeju regional administration said that efforts will be made to work with the other new seven wonders sites and to boost the island's many awe-inspiring natural assets in cooperation with the central government. The island will push for a special law to win more national support and expand important infrastructure such as its airport to accommodate more visitors. In 2002, Jeju was designated as a "biosphere reserve" by UNESCO and listed as a World Natural Heritage Site in 2007. It was also awarded "geopark" status last year, becoming the only place on the planet to receive all three UNESCO honors. It, however, suffered from a slow start, having set up a support committee one year after rivals in other countries. The relatively small number of people on the island and low overseas awareness of its beauties were other obstacles it had to overcome. The Swiss foundation, meanwhile, said the announcement reflects provisional results of the voting and that the calculations are now being validated and independently verified with the confirmed winners to be announced early next year during the official inauguration ceremonies. Jeju Island authorities, however, claimed that there is little likelihood of any changes in the results. '천혜의 보물 섬' 제주도가 세계 7대 자연경관에 우뚝 섰다. 유네스코 세계 자연유산 등재, 세계지질공원 인증, 생물권보전지역 지정 등 유네스코 자연환경 분야 3관왕에 이은 또다른 쾌거다. 스위스에 본부를 둔 '뉴세븐원더스(The New7wonders)' 재단은 한국 시각으로 12일 오전 4시7분(그리니치 표준시 11일 오후 7시7분) 홈페이지를 통해 제주도를 비롯한 7개 지역을 '세계 7대 자연경관'으로 선정, 발표했다. 알파벳 순으로 발표된 7대 자연경관은 브라질의 아마존과 베트남 하롱베이, 아르헨티나의 이구아수 폭포, 제주도, 인도네시아의 코모도국립공원, 필리핀의 푸에르토 프린세사 지하강, 남아프리카공화국의 테이블마운틴이다. 순위는 발표되지 않았다. 이들 지역은 재단이 최종 후보지 28곳을 대상으로 2009년 7월부터 올해 11월 11일까지 실시한 인터넷ㆍ문자ㆍ전화 투표 집계에서 상위 7위 안에 들어 영광을 안았다. 이번은 잠정 발표다. 재단은 후보지의 요구에 따라 공인기관의 검증 절차를 거쳐 몇 주 뒤에 최종 결과를 확정 발표할 예정이다. 그러나 순위가 뒤바뀔 가능성은 거의 없다고 제주도 관계자는 전했다. 제주도는 재단이 6일 중간집계해 발표한 상위 10개 지역에 이름을 올려 기대를 모았다. 12일 새벽 제주시 아트센터에서 숨을 죽인 채 초조하게 결과를 기다리던 제주도민과 최광식 문화체육관광부장관, 우근민 제주지사, 정운찬 제주-세계7대자연경관 선정 범국민추진위원회 위원장 등 1천여명은 이날 오전 4시7분 뉴세븐원더스 재단 홈페이지에 발표한 세계 7대 자연경관에 제주도가 이름을 올리자 두 손을 번쩍 치켜들어 환호했다. 세계자연유산 등재, 세계지질공원 인증, 생물권보전지역 지정 등 유네스코 자연환경 분야 3관왕에 빛나는 '보물 섬' 제주도의 가치를 재확인하는 순간이었다. 우근민 제주지사는 "말로 표현하기 어려울 만큼 기쁘다"며 "그동안 아낌없는 지지와 성원을 보내준 국민과 도민, 재외 동포 등 여러분께 고마움을 전한다"고 말했다. 우 지사는 유네스코 3관왕과 7대 경관을 접목한 환경체험 관광상품 등을 개발하고 7대 경관에 선정된 지역과 협력 기구를 만들어 서로 상생하고 발전하는 방안을 모색하겠다는 뜻도 밝혔다. 제주도는 세계 7대 자연경관 선정 결선 투표가 시작된 지 1년 4개월이 지난 2010년 12월에야 '제주-세계7대자연경관 선정 범국민추진위원회'를 구성, 본격적인 투표 운동에 뛰어들어 결선에 오른 28개 후보지 중에서 상당히 열세였다. 그러나 초반의 열세를 뒤엎고 7대 자연경관에 뽑히는 저력을 보여줬다. 이명박 대통령 내외를 비롯해 축구 스타 박지성, 프로골퍼 최경주, 한국계 풋볼 스타 하인스 워드, 노벨문학상 수상자 장 마리 귀스타브 르 클레지오, 오페라 가수 폴포츠 등 내로라하는 국내외 유명 인사와 전국 지자체, 경제계, 종교계 등 각계각층과 전 국민과 재외동포까지 열렬한 성원을 보낸 덕분이다. 제주도는 28개 최종 후보지 가운데 예비심사 7가지 테마인 섬, 화산, 폭포, 해변, 국립공원, 동굴, 숲 등 모두 갖춘 유일한 곳이라는 점도 유리하게 작용했다. 제주도는 세계 7대 자연경관 선정으로 제주와 대한민국에 대한 국내외 인지도가 높아져 관광객 증가 등으로 막대한 경제 파급 효과를 가져오고 제주도의 브랜드와 대한민국의 국격을 한 단계 높이는 계기가 될 것으로 기대했다. 제주발전연구원은 선정 이후 연간 관광객이 외국인인 최대 73.6%, 내국인은 8.5% 증가해 연간 최대 1조2천여억원에서 최저 6천300여억원의 지역 경제 파급 효과가 생길 것으로 예상했다. 제주도는 선정 효과를 극대화하기 위해 7대 경관지 간의 교류협력을 강화하고 특색있는 자연환경체험 관광상품 개발 등을 추진한다. 자문단과 지원협의회 등을 구성해 국가브랜드위원회와 함께 국내외 홍보 방안을 모색하고 중앙정부, 다른 지자체와 함께 우리나라의 자연환경의 자산 가치를 높이기 위한 공동사업도 발굴한다. 이를 위해 '제주도특별법'에 관련 사업을 추진할 때 국가 지원이 가능하도록 하는 특례조항을 신설하고 관광객 증가에 대비해 제주 신공항 건설을 앞당겨 주도록 정부에 요청할 계획이다. 가칭 '뉴세븐원더 지역 국제교류재단'을 제주에 설립, 운영해 7대 경관 지역 간의 교류협력을 강화하고 유네스코 자연환경 분야 3관왕과 연계한 독특한 자연환경체험 관광상품을 개발해 관광상품의 부가가치도 높일 방침이다. 제주도는 세계 7대 자연경관지 선정을 기념해 성산일출봉, 만장굴, 돌문화공원, 천지연폭포, 민속자연사박물관, 제주현대미술관 등 공영관광지 25개소를 이날부터 연말까지 무료로 개방한다. ■뉴세븐원더스 재단은 = 스위스에 본부를 둔 '뉴세븐원더스'는 스위스 출신 캐나다인인 버나드 웨버(Bernard Weber)가 창설한 비영리 재단이다. '우리의 유산은 우리의 미래(Our heritage is our future！)'라는 구호 아래 세계의 유적을 관리, 보존할 목적으로 2001년 5월 설립됐다. 재단은 1999년부터 2007년 7월까지 전 세계 1억명이 인터넷과 휴대전화로 투표한 결과를 종합해 '신 세계 7대 불가사의'로 선정한 바 있다. 중국의 만리장성, 페루 잉카유적지 마추픽추, 브라질의 거대 예수상, 멕시코 치첸이차의 계단식 피라미드 마야 유적지, 로마의 콜로세움, 인도의 타지마할, 요르단의 고대 산악도시 페트라다. '세계 7대 자연경관'은 이 재단이 2번째로 진행한 프로젝트다. 세계 440곳을 대상으로 홈페이지(new7wonders.com) 인터넷 1차 투표(2007년 7월∼2008년 12월)와 인터넷 2차 투표(2009년 1월∼7월), 전문가 심사를 거쳐 제주도와 코모도국립공원 등 최종 후보지 28곳을 선정했다. 이어 인터넷과 문자, 전화 투표(2009년 7월∼2011년 11월 11일)를 거쳐 세계 7대 경관을 선정, 발표했다.